With spring finally making an appearance I took the opportunity to get Rosalie’s arms out! This lovely little blouse was a dress in size 3 – 6 months that Rosalie wasn’t able to wear as it wasn’t weather appropriate when se was that size. I’m so glad she can wear it now as a top as I really love the vintage style and think it looks really cute. It does come with bloomers which still fit her at the moment but I didn’t think it was quite warm enough for both legs and arms out. Unfortunately I think Rosalie will have out grown these come our holiday in June. Im not sure where the dress and bloomer set are from as they were a gift for Rosalie when she was born. The lace frill leggings I’ve paired the top with are from peacocks. 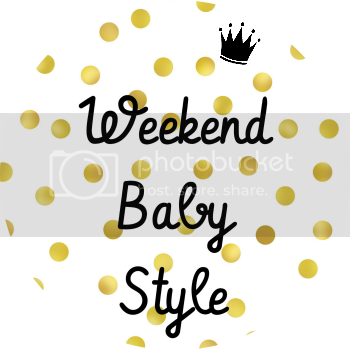 If you’d like join in with this week’s weekend baby style you can do so here.